Turmeric is a rhizomatous herbaceous perennial plant of the ginger family, Zingiberaceae. It is native to Southeast Asia, and requires temperatures between 20 and 30 °C (68–86 °F) and a considerable amount of annual rainfall to thrive. Plants are gathered annually for their rhizomes and propagated from some of those rhizomes in the following season. 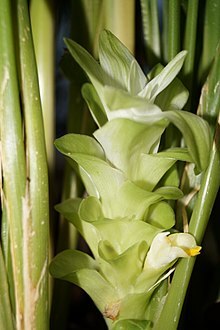 When not used fresh, the rhizomes are boiled in water for about 30–45 minutes and then dried in hot ovens, after which they are ground into a deep orange-yellow powder commonly used as a coloring and flavoring agent in many Asian cuisines, especially for curries, as well as for dyeing. Turmeric powder has a warm, bitter, pepper-like flavor and earthy, mustard-like aroma. Although long used in Ayurvedic medicine to treat various diseases, there is little high-quality clinical evidence for use of turmeric or its main constituent, curcumin, as a therapy.